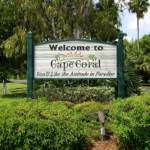 Daylight hours are all about enjoying the beach, local shops, wildlife attractions, and cycle trails on Sanibel and Captiva. But after sundown, these sleepy islands have plenty of places to enjoy nightlife if you know where to go. Here are some suggestion for things to do on Sanibel and Captiva after dark, whether you are visiting for a short break or live on the there year-round. 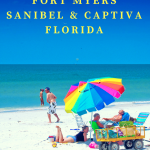 Sanibel has several theaters that put on regular productions for those seeking light cultural entertainment. Big Arts (Barrier Island Group for the Arts) has a wide program of music, dance, theater, films, workshops, and lectures. The Box Office and Galleries are at 900 Dunlop Road on Sanibel with offices at 2244 Periwinkle Way. The Herb Strauss Theater at 2200 Periwinkle Way is part of Big Arts and hosts Broadway-standard shows, musicals, dramas, and comedies. 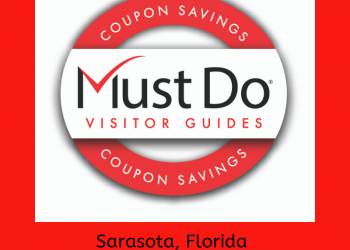 Located in a renovated school house, it is a charming place to enjoy Sanibel nightlife. Check out the Big Arts website for a complete schedule. Other cultural festivals and entertainment to look out for as part of Sanibel’s nightlife include the Sanibel Music Festival, which organizes a program of concerts and performances in March at the Congregational Church on Periwinkle Way. 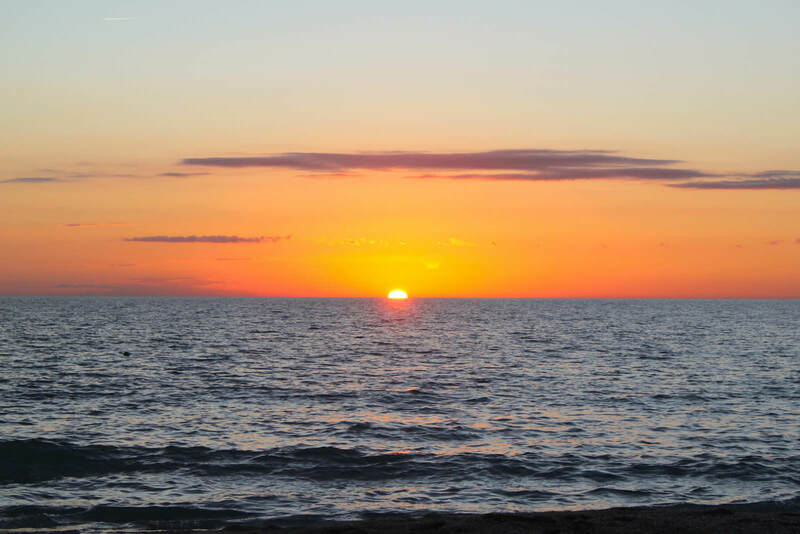 Sanibel Island is famous for its vivid pink and red sunsets that light up the clear blue sky at dusk. The best way to enjoy a sunset is on a one-hour Sunset Cruise around the islands with Captiva Cruises or Adventures in Paradise. 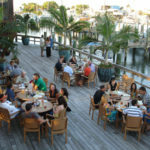 The Mucky Duck on Captiva opened in 1975 as a place to enjoy a drink and watch the sunset from the well located bar-restaurant. In fact, it has become so famous for sunset-watching, you can actually check the sunset times on their website! It has a British pub ambiance, where The Black Swan is a common name for a hostelry, often affectionately nicknamed The Mucky Duck. 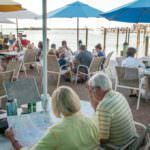 The Green Flash (appropriately named after the emerald green flash that occasionally appears as the sun dips into the sea) is another popular place to toast the sunset on Captiva and enjoy a meal overlooking the marina. You could argue that every waking moment on these idyllic islands is Happy Hour, but after dark most restaurants and bars offer bargain cocktails and drinks in the early evening. Fortunately, many places can be reached on foot along the bike trails, making it easy to enjoy an alcoholic drink or two safely. Cip’s Place offers Happy Hour drinks daily from 4 to 6 p.m. including $1 off draft beer, martinis and wines and a choice of five appetizers for $5 each. Live music can be found nightly at George and Wendy’s Seafood Grille. It has Jams on Monday nights, Open Mic on Tuesday, Ladies Night with half price drinks on Wednesday, Karaoke every Thursday and live music gigs on Friday and Saturday nights. 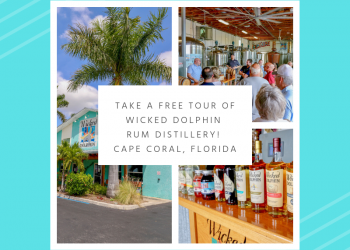 Outdoor patios where you can enjoy live music with a drink or meal include Doc Ford’s Rum Bar on both Sanibel and Captiva, RC Otter’s and Key Lime Bistro on Andy Rosse Lane on Captiva. Traditions on the Beach located at the historic Island Inn has a good variety of live music, dancing, and nightlife on Sanibel’s West Gulf Drive. Check their Events Calendar and enjoy vocalists such as Woody Brubaker, Barbara Smith, and many others. 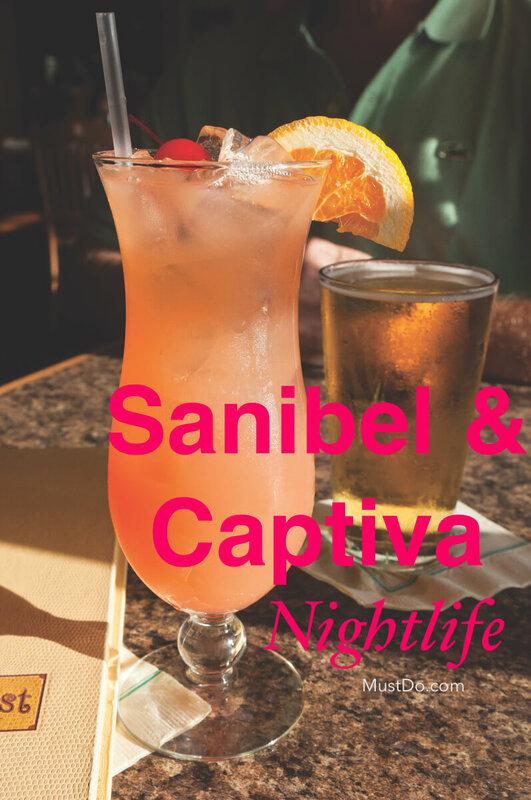 With so much happening, who says there’s no nightlife on Sanibel and Captive Island!